What can be said....This design has been probably one of the best selling large dome tents available in the United Kingdom for the last 3 years. As a result Sunncamp decided to make the tent available in a Polyester/Cotton version known as Sunntex. This gives the tent a longer life as well as being cooler as this material can breathe. 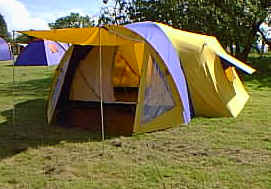 The tent has a large front porch area with an groundsheet supplied and two separate zipped sleeping compartments with a ground sheet between the two areas, so if you wish or need this can be made up to a 6 berth dome tent which is tall enough for the average person to stand up in the centre of the tent.